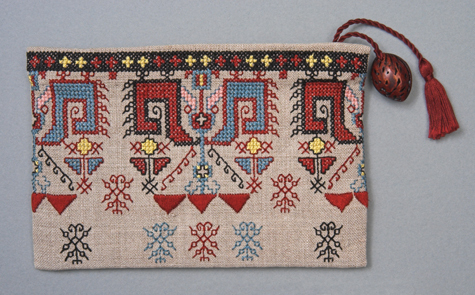 This handbag is embroidered in cross stitch, back stitch and satin stitches. This piece was part of a travelling exhibition spearheaded by Lady Tweedsmuir, wife of Canada’s Governor General in 1937. The Women’s Institute of Manitoba, with the Crafts Guild, collected of such handmade articles which became known as the Tweedsmuir Collection.